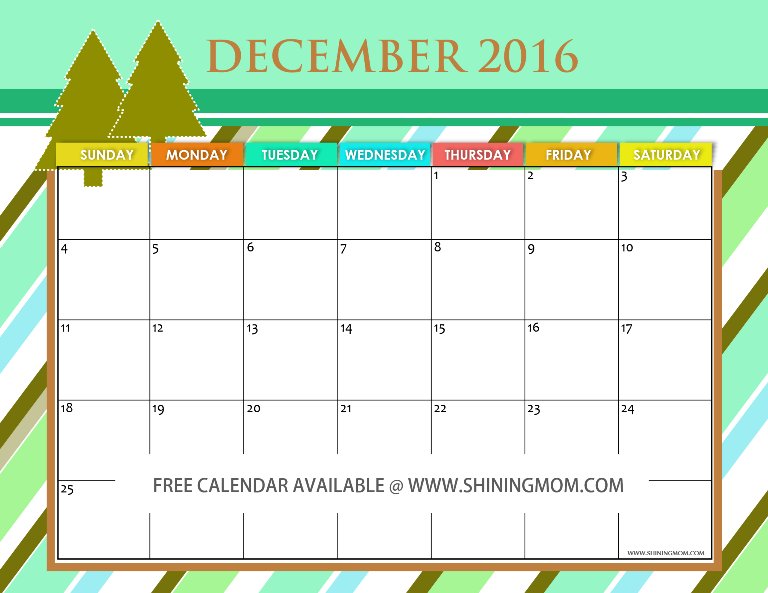 Free December 2016 Calendars: Christmas Themed Designs! 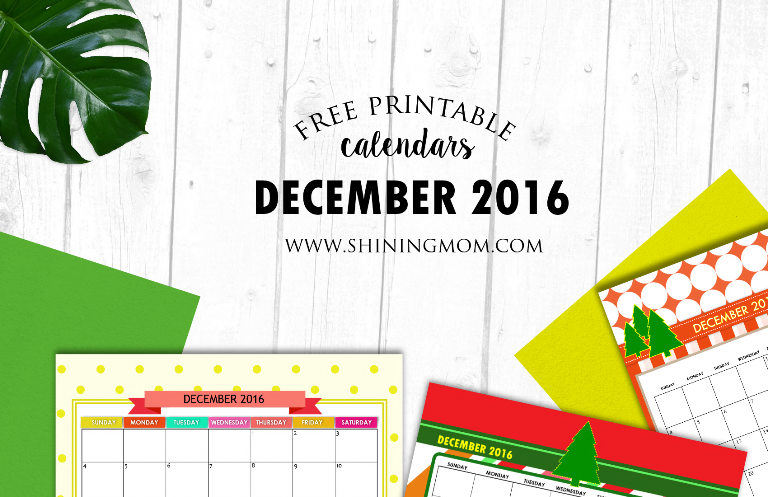 Would you like your calendars for the Christmas season ready by now? 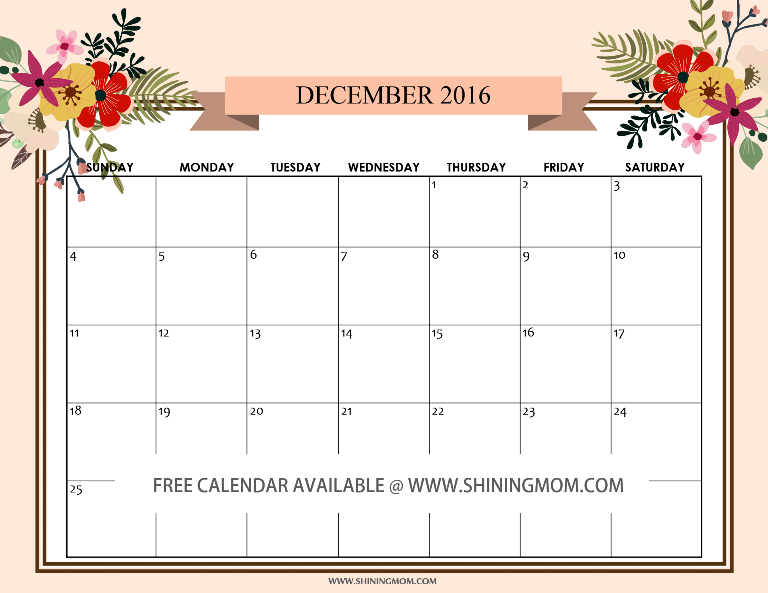 Well then, I am delightfully inviting you to read along as I present to you my bright and colorful free printable December 2016 calendar collection! It’s December before you know it! With reunions and parties to attend, gifts to buy and wrap, relatives and friends to visit, I know Christmas season can be a busy one! 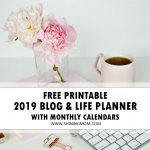 And because I know your December is going to be full (well, the happy kind), I am now giving you your pretty planners so you can plan the month ahead! Isn’t it that we can have more time for fun if our days are planned? 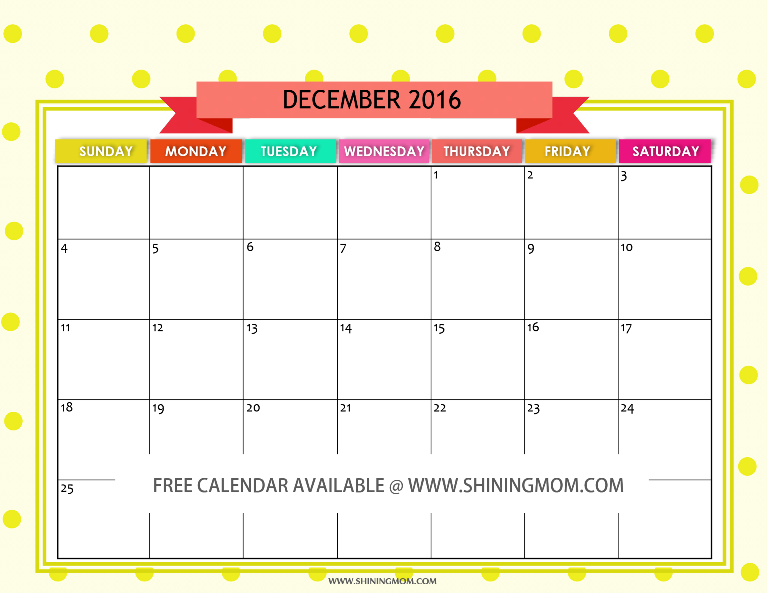 Before you take your calendar pick for this month, I am making a little suggestion. Since it’s the season of giving, I am inviting you to print not just a calendar for yourself from this set, I am also inviting you to print some copies for your officemates and friends this time! Okay, here’s the plan. 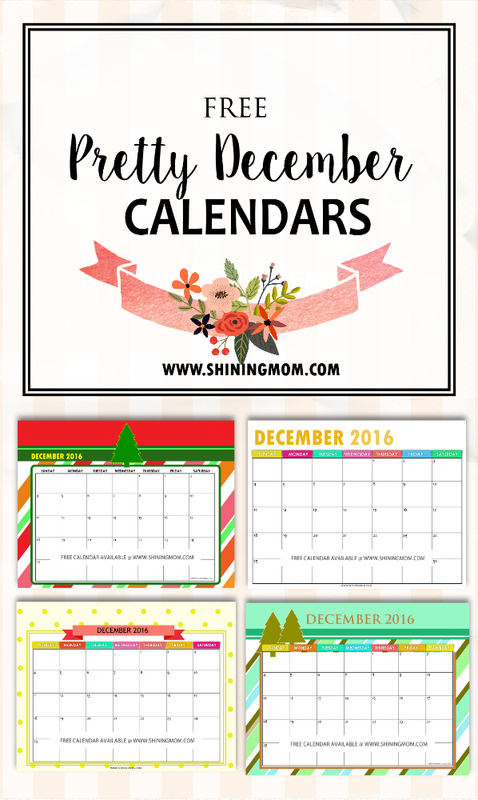 On the first day of December, surprise the people around you with any of the these bright and festive calendar designs that I am sharing. 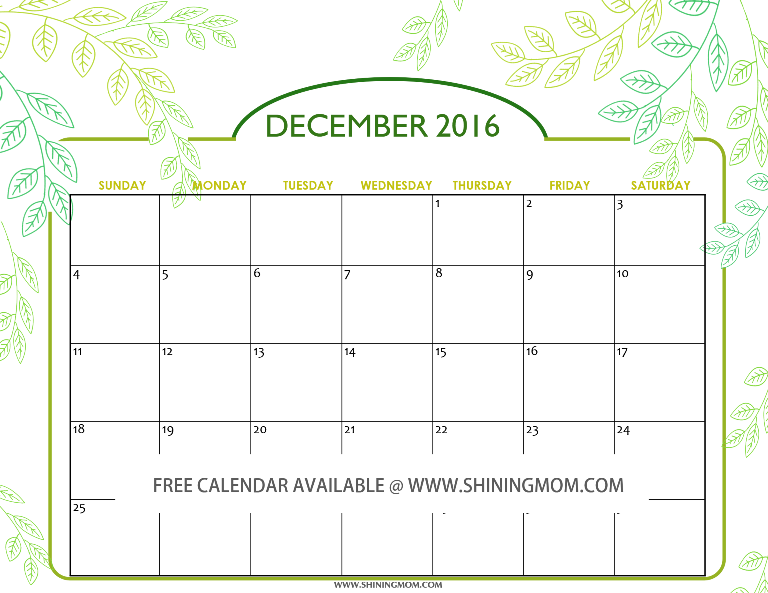 To use, print the calendars in special papers that are sized 8.5×11″ (standard, letter size) and you have a gift to share! It’s going to be a beautiful way to remind your loved ones that Christmas season is starting hence the spirit of giving! Ooops! Don’t forget to stick a little note that says something like, “Merry Christmas” and place your calendar gift on your friends’ working table! How do you like the idea? Yup! From this set, you’ll get to enjoy 11 lovely calendar designs! They are bright, colorful and festive just like how your Christmas should be! 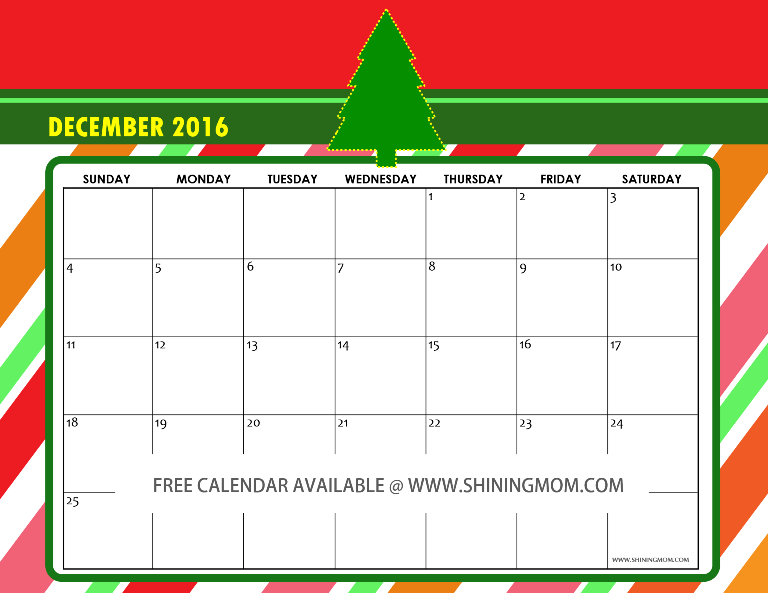 Here then are your free Christmas calendars! Your PDF file is towards the end of the post! I love how festive this first calendar in the set looks! Seems like it’s setting the mood to a fun Christmas party! 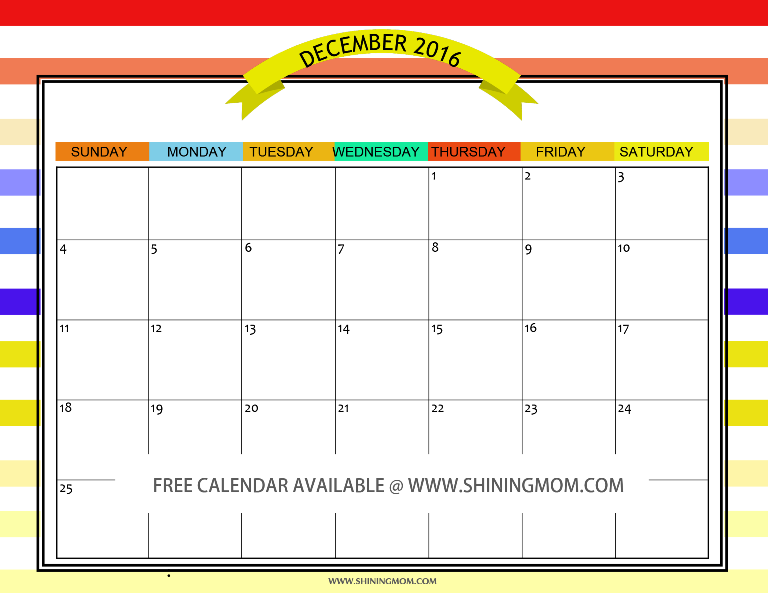 Print this for your kids because they will love the happy colors or print this for your teacher friend because it will make a great Christmas countdown calendar to use in her classroom! This next calendar is in full Christmas spirit! 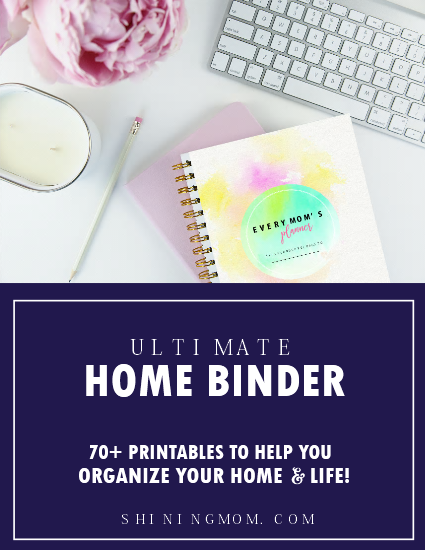 Get this for yourself and your friends! 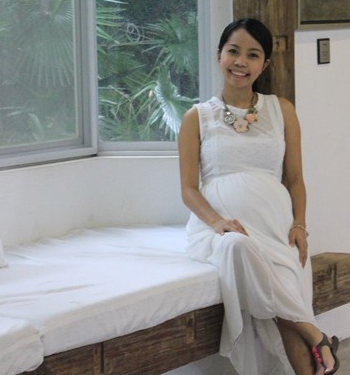 Funnily, I see a lot of you searching for a girly calendar design and you end up in my blog. 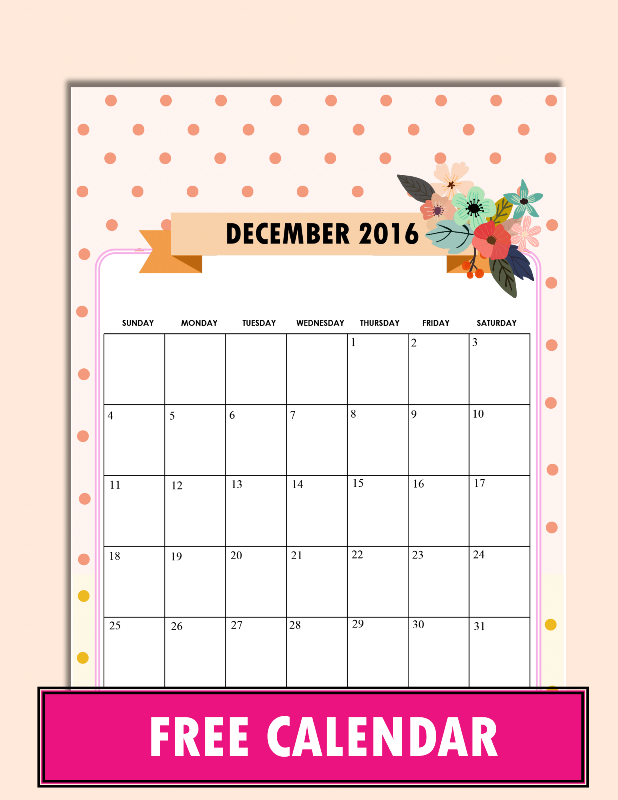 To those of you looking for a feminine calendar to use this December here’s a truly girly one! The flower design is a licensed purchase from Creative Market! A lot of you say that you love this design so here it is again! Those swaying leaves are just perfect to set your Christmas to the right mood! Such a relaxing feeling to see them! 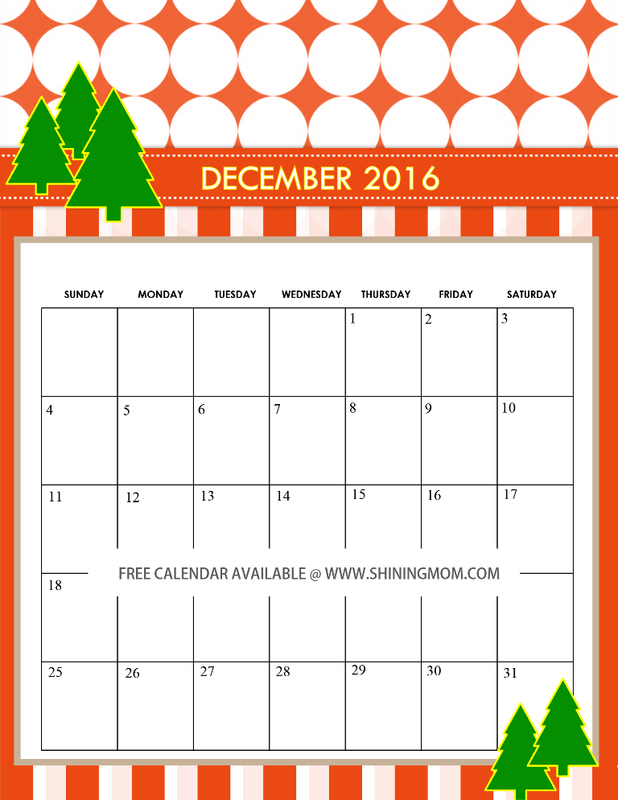 Looking for a cute Christmas calendar to print for the kids? Well, here’s another great option from this set! 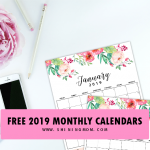 Unlike the other calendars you see here in landscape format, this calendar together with the calendar below are not included in the single file PDF download. Should you like to use this one, please go HERE. Here’s another pretty design for you, ladies! You may get your copy HERE should you like to use this particular design! 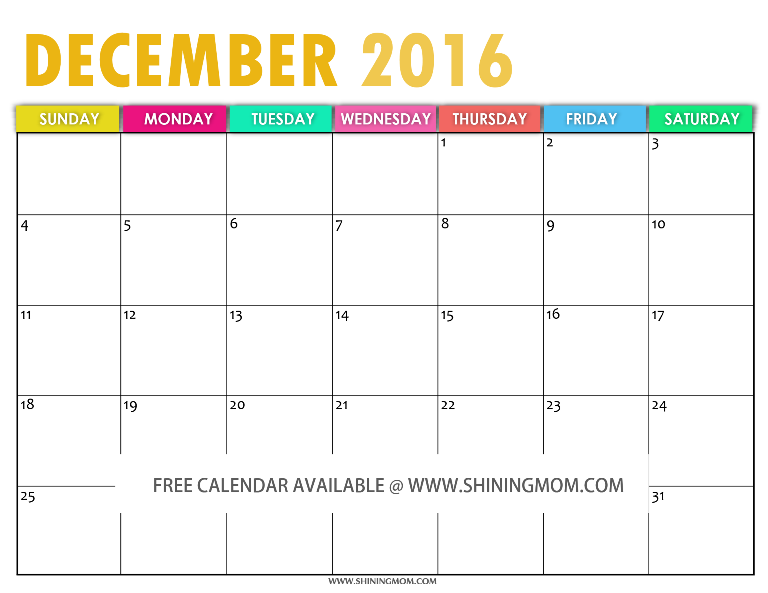 Do you want your free December 2016 calendar to be in truly happy colors? 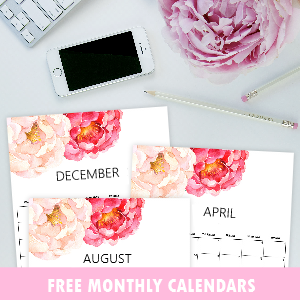 Or, do you have a friend who you think would love to have a truly cheerful calendar to use? This then is the calendar you should get! 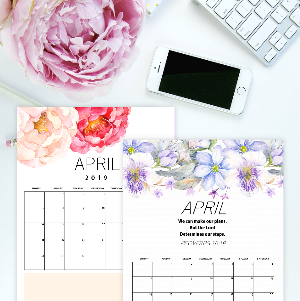 One of the most-loved designs since its release is this elegant calendar that I am again sharing! Do you think one of your friends will love to have this design? As can be seen, your next calendar is again Christmas themed! Where do you thin you can use this? In your office maybe? This last calendar in the set is hands down my ultimate favorite! 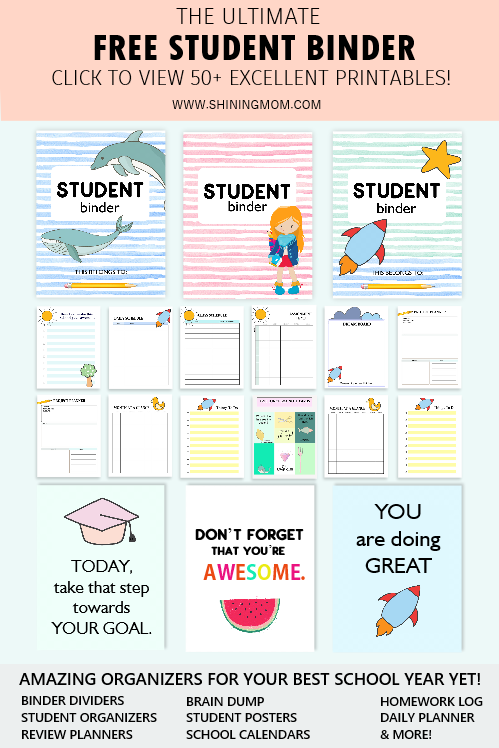 So bright and cheery with plenty of spaces for your notes! Hey, hey, everyone! Did you know that I have shared this calendar as a set for next year? Yup you can now download a set of this calendar for all the months of 2017. Just go HERE to get your copy! That’s it! 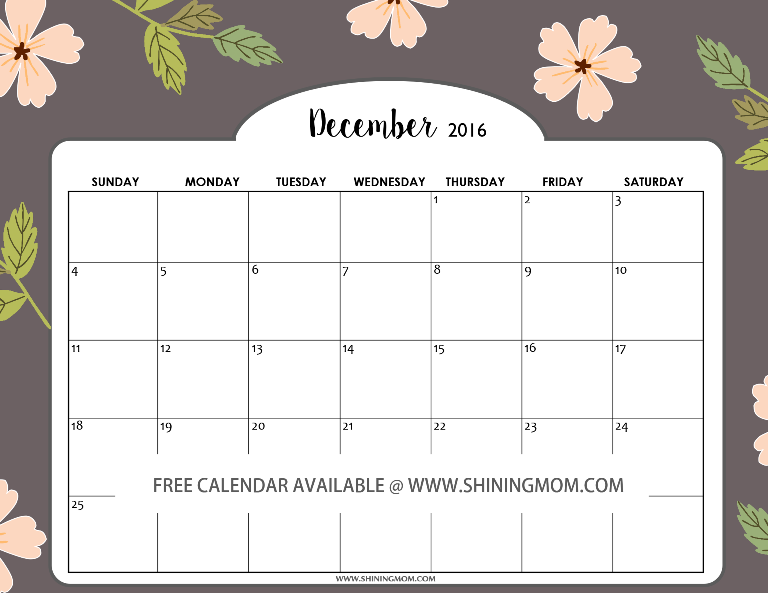 Eleven free printable December 2016 calendar for you and your friends to enjoy! 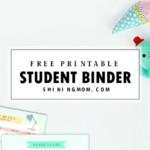 I hope you can use them! =) Please be reminded that the photos posted above are just for your preview. The calendars are in PDF copies without the loooooong watermark and you can find them HERE! 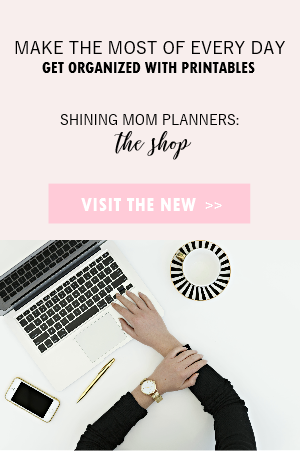 UPDATES: Be sure to catch Shining Mom’s calendars and planners for next year. They’re absolutely darling, I think you’ll love them! 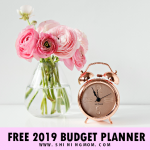 Plan the year ahead, now! Have a great day everyone and may you have a merry, merry Christmas! 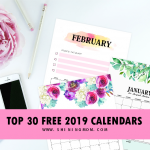 Would you like to feature these calendars in your site? As you do, please use one image only (the topmost photo or the one above) and link me back directly to this post. Sharing the monthly calendar previews are strictly not allowed and downloads may only be done here. Pinning any of the images at Pinterest is loved and appreciated! Thanks! Thanks for sharing! But when I click the link to the file, it says File not found. The link has been repaired! Thanks for the heads up, I wouldn’t know it without this comment from you. Some links have been acting weirdly lately after the mew theme update, hope everything will be fine soon! Hi! There are two calendar designs in portrait from this set, the red one (Christmas-themed design) and the pink one (in pink polka background with flowers). 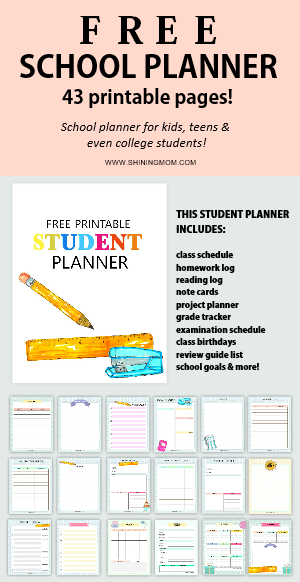 I hope you can use them!